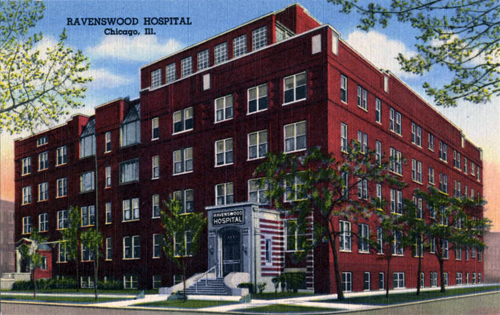 Photo (source): Ravenswood Hospital as it appeared in 1945. The American healthcare system is for profit. American citizens’ health, safety, and well-being are managed by large companies looking to stay in the black. The other democracies and various forms of government in industrialized nations have recognized the danger that this poses to general public. While private medical care still thrives in these countries, there is at least a public healthcare plan to insure that all citizens have a safety net. The United States is the only country where citizens decide between health and crushing debt, even if they have insurance. These medical bills often go unpaid as patients hover around bankruptcy or simply do not have the means to pay them. Despite the inability of patients to pay, healthcare providers are required by federal law to treat patients. To stay financially competitive healthcare providers seek to mitigate their risk and cut costs wherever possible. For one Chicago youth those risk-averse penny-pinching measures hastened his untimely death. 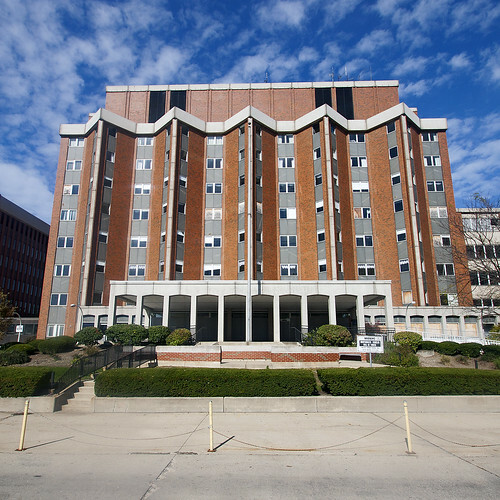 Photo: The Adler Pavilion portion of Ravenswood Hospital. While playing basketball on North Wolcott Avenue, Christopher Sercye, age 15, was shot twice in the abdomen by gang members on Saturday May 16, 1998 around 6pm. His panic-stricken friends dragged Christopher about 100 yards to the ramp outside the emergency room of the nearby privately-owned Ravenswood Hospital before collapsing. Some reports say the injured teen was within 30 feet of the door, while others say he was 50 feet. In any case the teen was well within view of hospital staff. The first of five separate phone calls to emergency services came in at 6:15pm. One friend ran inside the hospital and got two police officers to rush to Christopher’s aid. The officers and witnesses begged hospital staff to assist, but they demurred citing hospital policy that forbid them to exit the building. The officers on scene were also bound by protocol to not move injured people and wait for paramedics. At 6:23pm a request for an ambulance went out over police radio. Ignoring protocol one of the officers finally commandeered a wheelchair and rushed Christopher into the emergency room with a barely detectable pulse. 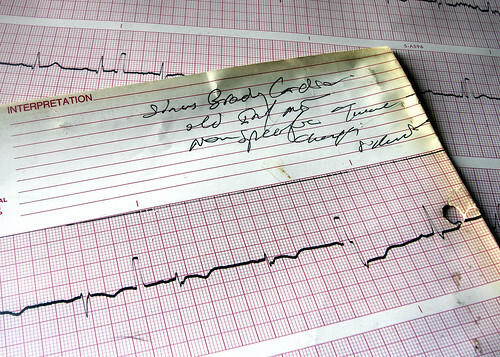 Photo: EKG readings from a patient file left in the hospital. An ambulance finally arrived on scene at 6:29pm, but left after seeing Christopher being wheeled into the hospital. Emergency Room staff began administering treatment immediately. Two minutes later Christopher suffered cardiac arrest. Doctors discovered that the bullets punctured Christopher’s aorta, mesenteric vein, and colon. Christopher was pronounced dead at 7:33pm. Prime suspect Aureliano Fajardo was arrested the next day. Two other accomplices, Salvador Aguilar and Lionel Duran, were also arrested in connection with the murder. Fajardo and Aguilar were kept on $1 million bond, while Duran was kept on $500,000 while charged with first-degree murder. Two days after the shooting Ravenswood president and CEO John E. Blair rescinded the policy preventing hospital staff from exiting the building. In response to Christopher’s death Blair stated, “Above all, I want to make sure that if a tragedy like this ever occurs again, we have a different result. Media reports of the tragedy of Christopher’s death garnered national outrage. President Clinton threatened to revoke the $59 million annual Medicare funding for the hospital, but was later overruled by the Health Care Financing Administration. Those who remember 8th grader Christopher Sercye described him as a leader with sense of humor. His family filed a lawsuit against Ravenswood Hospital later that year. In 2003 the courts ruled in favor of the family and awarded them $12.5 million for the wrongful death. That same year the “250 Yard Rule” was amended to the EMTALA law. The rule states that healthcare providers are required to respond to any “presentation” warranting medical assistance within 250 yards of the main hospital campus building. 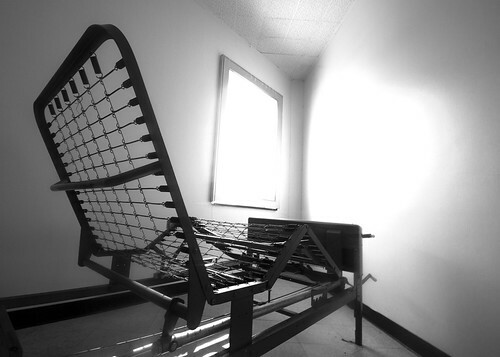 Photo: A hospital bed takes up a majority of floorspace in this cramped patient room. Ravenswood Hospital had long been a pillar of the north side Chicago community before being embroiled in controversy. The original hospital was built in 1907, but by the 1990s had expanded to meet community demands. The hospital had just under one thousand beds at its apex. It also included ambulatory care, a psychiatric unit, rehabilitation, oncology, coronary care, trauma ward, nursing school and student residence on site the 7.5 acre site. The hospital fell on hard times during the 1990’s as HMOs, insurance companies, Medicare and Medicaid began cutting costs wherever they could. Advocate Health Care purchased the flailing hospital in 1998 much to the chagrin of community members and hospital staff. Blair, the hospital president and CEO who had weathered the Christopher Sercye debacle, said “In the weeks to come we hope everyone will agree that this move has great potential for employees and will enhance our ability to serve the community.” Almost immediately Advocate began consolidating medical services with other are hospitals it owned. Despite the drastic cuts the hospital managed to operate at a $35 million loss in 2001 alone. Ravenswood’s closing could not have come at a worse time as a number of historic Chicago area hospitals, such as Edgewater, were closing their doors. When Advocate finally sold the hospital they salted the earth by including a non-compete clause forbidding new owners to operate a medical facilty. 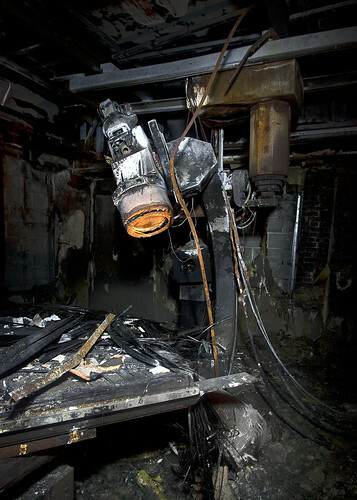 Photo: An X-Ray machine on the top floor scorched by fire. A majority of the hospital was closed off while other parts were rented to various tenants. Ravenswood may limp along until its ultimate demise, but its death makes way for new life. Private school Lycée Français de Chicago plans on demolishing the entire complex in 2013 to make way for a new building. If the school is able to raise the necessary funds they will occupy their new home by 2015. There are currently 50 million Americans who do not have health insurance coverage. Even those who are insured risk being dropped by insurance companies should they incur medical bills. As Americans we pay not only a financial cost, but also a social cost (PDF) when profit is placed over health and well-being. Ain’t No Way To Go – Article on Christopher Sercye’s tragic death. Answers – Discusses the hospital closure in 2002. Center Square Journal – Lycee Francais de Chicago will demolish the site in 2013. Chicago Reader – Controversy over the Ravenswood Hospital closing. Chicago Talks – Financial stress ultimately leads to the hospital closing. Chicago Tribune – 1998 article on Medicare funding for the hospital. Chicago Tribune – 1998 report of the crime and subsequent arrests. Chicago Tribune – 1998 article mentions Christopher Sercye’s funeral. Chicago Tribune – 2001 article about Fajardo committing murder behind bars. Curbed Chicago – Architect mockup of what the Lycee Francais de Chicago building would look like. emtala.org – Explains the EMTALA 250 Yard Rule. Flickr – Nitram242’s Chicago Hospital Closure set. Google Books – Jet article states that Christopher Sercye was shot in the heart. Hospital Data – Statistics for the facility. New York Times – Mentions Christopher Sercye being dragged “within 30 feet” of the hospital. Power Rogers & Smith – Lists the 2003 $12.5 million settlement for Christopher Sercye’s wrongful death. Scribd – Lycee Francais site survey from 2007. Slate – Opinion piece about the policies that led to Christopher Sercye’s death. Sun-Sentinel – 1998 article on Christopher Sercye’s death. USA Today – Settlement announcement for Christopher Sercye’s death. YouTube – Video shot in the hallways. YouTube – Hospital closing reaction video. To be fair, the hospital was not a trauma center, did not have trauma surgeons on the premises and was not equiped to care for the teen who had been shot. He might have been saved had he been transported to Illinois Masonic which is the nearest trauma center. Of course, making a big deal of the death was a case of making political hay of a bad situation.